I have just posted the new, HD version of How to Ladder Stitch. It has been considerably updated to include more information on properly pinning doll parts and to make the general presentation easier to understand. I hope you enjoy it. Something new is coming up soon. I have just completed the 3rd Edition of Victoria Rose. It has been updated and simplified with more pictures. It can be displayed on your smartphone or tablet as well as on your computer and possibly your television. The instruction book (and 2 shopping lists) come in three formats: AZW for Kindle, EPUB for most smartphones and tablets, and PDF for large screens such as laptops and desktops, and for printing. 1. Mimi’s Video Handbook for Cloth Doll Makers contains 13 videos about all aspects of cloth doll making, including the new videos posted here recently. They will play as a regular DVD on your TV or computer, or you can play them as MP4 videos on your smartphone or tablet. 2. Mimi’s Basic Shopping List for Cloth Doll Makers discusses everything you may need for dollmaking from sewing machines to pins and needles, dressmaker’s shears, pipe cleaners for wiring fingers, armature materials and tools, and where to find everything along with specific brands and recommendations. It can save you lots of time and money by showing you what to get (and why) without having to do the research yourself. It should be ready to go in the next two or three weeks. It is currently out being edited by Vicki Petticord to help make sure I haven’t missed anything, and that it is as simple as possible to understand and use. Look for the announcement here soon. Here is a new video on disappearing markers for dollmaking. It includes the new Pilot FriXion heat-activated disappearing gel pen. Mimi and I created this as part of Mimi’s Mannequins, and I’m finally getting around to posting it. I have several more videos and patterns to post, so expect them soon. I want to thank all of you for your prayers and good wishes. Many of you have asked about how Cassi and I are doing/coping with Mimi’s passing. I’m going to attempt to give you some idea in this letter. As those of you who know me are aware, I am very much an introvert who doesn’t like to be around people much. However, having lived with Mimi for more than 40 years, I’ve gotten used to living in a goldfish bowl. Besides, it might be therapeutic. Mimi died early Sunday morning around 2 am, February 19, 2017. The hardest night was the Friday before she died. I was in pain the whole night. I think it’s because I knew she wasn’t really there anymore. I was alright Saturday, and even Sunday, but Monday I had several sobbing episodes. The rest of the week has been mostly lethargy on my part and Cassi’s part. Both of us were hardly able to function. We have been working hard at getting just one task done each day. We spend a day on the dresser and clothes drawers, and another on the closet. We spent an entire day just taking the clothing to the Hope Chest and Goodwill. We spent a day on the bathroom. We spent a day food shopping. That’s five of the ten days, and mostly we didn’t do anything the rest of the days. I am binge reading and binge watching Netflix. I find it hard to do anything else. I don’t have trouble sleeping, but I have a lot of trouble getting out of bed. Cassi has hyperextended ligaments all over her body. That means she is “double jointed” everywhere. From a more practical point of view, it means that her toes and knees and shoulders dislocate by themselves frequently. That prevents her from working more than 3 or 4 hours at a time. For some reason, she was dropped from Medicaid (thanks Florida) and we have to reapply for social security SSI and fight our way through the bureaucracy. I have a number of other tasks that I will get to as I can. Dolls and gifts for family members. Send personal thank you messages to as many of you as I can. New ebook of Victoria Rose pattern. New ebook of Pretty Faces videos. New pattern for High Priestess. Finish my book and deck of Tarot Cards. I really have no idea how we are going to do this. We have a Canadian Lynx and a Mink fur coat that she was saving to make teddy bears (neither is wearable). We have enough beads and bobbins and threads and art supplies to fill up an art supply store. Oh, well, Mimi always said: “She who dies with the most stuff, WINS!” I just didn’t think she was serious. After a five year battle with cancer, Mimi passed peacefully at 2am on February 19, 2017. She is survived by her husband Jim, her brother Alan Jackson of Long Beach, Ca, her daughter Cathie Condon of New York City, three grandchildren and three great grandchildren including Cassi, 20, who lives with her and her husband in Fort Myers, FL. There will be no services, and her ashes will be scattered in the Atlantic Ocean, the Pacific Ocean, and the Gulf of Mexico. In her death, as well as in her life, she would have wanted to contribute to the dollmaking world. In lieu of cards or flowers, please contribute to help Lisa Lichtenfels who is also battling cancer at: https://www.gofundme.com/inspirelisa or by contributing to the American Cancer Society. And what Mimi would enjoy most, is for you to get together with your fellow dollmakers at your next convention or doll club meeting and have an ice cream social to commemorate her life. 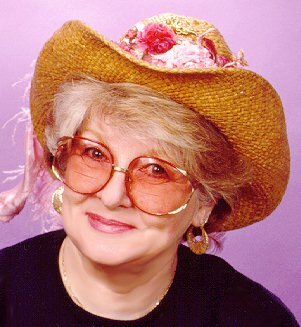 Gloria J. “Mimi” Winer has been an original cloth doll artist since 1983. She has studied fine arts at the National Academy of Arts and Design, the School of Visual Arts, the New School/Parson’s School of Design, and with Pe Ling Liang of NYU. She studied sculpture at Monmouth College. She has studied dollmaking with NIADA artists Lisa Lichtenfels, Bob McKinley, Martha Armstrong Hand, Mr. George Stuart, Antonete Cely, and many others. Gloria was a member of the Society of Creative Designers for 25 years before it was disbanded in 2007. She is an artist member of the Original Doll Artists Council of America (ODACA), the Canadian Doll Artists Association (CDAA), the Textile Study Group of New York City, and is Past President of the National Doll and Toy Collector’s Club of New York City (UFDC). Her business is a member of the Creative Industries of America Association. She is or has been a member of the Board of Directors of several Doll Art Organizations. Her work as a doll artist represents the leading edge of what can be done with her medium. She is constantly seeking out and testing new materials, has developed many new techniques and invented some exclusive tools. Gloria shares her information with the doll and craft world through her (retired) quarterly magazine, Let’s Talk About Dollmaking, columns and frequent articles in many Doll, Art and Craft magazines, her web site at Mimidolls.com, and through the books and patterns she writes with her husband and partner for more than 30 years. Among their publications are many instructional patterns and an in-depth study of the new clays, Mimi’s New Clays for Dollmaking. Gloria’s doll patterns include lengthy step-by-step instructions so that even beginning dollmakers can successfully complete a doll. Effectively they are instructional books that allow many variations over and above the specific doll. They typify her outstanding ability as a teacher. She loves sharing her techniques and it shows in all her work. Gloria is in constant demand throughout the U.S.A, Canada and Australia to teach at conferences, seminars, and doll clubs. Gloria Winer’s work has been well recognized by her peers. She received a special award for her contributions to cloth doll making from the National Cloth Doll Makers Association, and a Presidential Award from the National Institute of American Doll Artists ( NIADA), and for her contributions to that organization. Most recently she received the First Award in Excellence for the significant contribution made in the development of the first Masters Magic and Apprentices Workshops held at Maroochydore, Australia in 2005. Gloria’s prizes for her original dolls include a 1st and 2nd award in the Artist Division at the UFDC National Conference in 1994 and 1993, and 1st place in the 1994 competition at Dimensions in Cloth, an annual exhibit and competition for cloth dollmakers. Gloria’s work has been part of Dollmaker’s Magic and The Figure in Cloth; shows that traveled throughout the United States to galleries and museums. Her work has also been on exhibit at the Wenham Museum, Wenham, MA, in two exhibits of Dolls of the 21st Century at the Springfield Museum, Springfield, OR, and by invitation at the Musée des arts décoratifs, Palais du Louvre, in Paris. Gloria’s work has been featured in several books by her peers including: The Anatomy of a Doll by Susanna Oroyan, Mother Plays With Dolls, by elinor peace bailey, Cloth Dolls From Ancient to Modern, A Collector’s Guide with Values by Linda Edwards, and in numerous doll magazines. Since 2004, Gloria has created and donated a yearly bear to theBroadway Bears Annual Auction, a part of the Broadway Cares, Equity Fights AIDS Foundation. This charity raises funds for Broadway theatrical employees suffering with AIDS and HIV by auctioning teddy bears dressed in recreations of original Broadway theater costumes. Our thanks to all of you who have been so generous with your prayers and well wishes. We appreciate every one of you. Cassi and I hope to be able to publish three new Mimi patterns (Mimi’s Wee Folk – Elves, The High Priestess, and Spartacus) that are almost finished in the near future. We will also be re-issuing Pretty Faces and Victoria Rose as e-books in a few months. Mimi has had a very bad week. She got up by herself to get something from the kitchen and fell. She bruised some ribs. For a couple of days she was getting weaker and weaker, so we took her into the hospital. They kept her 3 days adding fluids and running tests. Then they recommended that we take her to a hospice. She has been at the hospice since Friday 2/10. Today is Monday, 2/13. The doctor says she is deteriorating rapidly as her body shuts down. She will no longer eat or drink. The doctor thinks that she will last at least until Wednesday 2/15 when her daughter Cathie and her brother Alan arrive.